Crushin' Columns is the first level of the secret Cloud world from Donkey Kong Country Returns 3D. It represents the first world of the game, the Jungle. Despite the level's name, the main mechanic of the level is the tilting platforms that operate by standing on either side of them, while moving columns appear less often. At the starting point, Donkey Kong and Diddy Kong can walk left to find a plant containing a Banana Bunch. As the Kongs walk right, they will find a platform that moves left and right depending on which side the Kongs stand on. After tilting the platform to the right end of the path, the Kongs must defeat some Frogoons and enter a Barrel Cannon which sends them deeper into the jungle. The next area has a horizontally moving platform similar to the one in the first area, except this one is tilted by grabbing the grass on its underside. By moving it all the way to the right, the pillars that blocked the Kongs' way will move apart (A twenty-Banana Bunch can be found behind the leaves on the left). More platforms must be tilted to clear paths and to produce more pillars to be used as platforms. After passing under two Chomps, the Kongs must tilt another grassy platform to a Barrel Cannon surrounded by two Tiki Zings, a Heart and a Banana Coin. The Barrel Cannon leads to the next area and the first checkpoint. After the checkpoint is a vast waterfall with more tilting platforms. The Kongs must use the grassy platform to cross the Tiki Zings and Tiki Tork. After lowering a pillar via a tilting platform, the Kongs will encounter a bridge which will shortly be destroyed by a Giant Pillar. The Kongs must wait for it to fall and use a Barrel Cannon to cross the gap. On the other side is a giant button which must be pounded several times to make a series of Barrel Cannons appear. The Kongs should then be launched by the cannons to a column which will tilt to the right when they stand on the right side. After bouncing along multiple bouncy flowers, the Kongs will find a tilting platform leading to a series of Barrel Cannons and the next checkpoint. Screaming Pillars can be found at the beginning of the next area. After the Screaming Pillars are some bouncy flowers that bounce the Kongs to a higher area. In this area, the Kongs must dodge some Chomps, Tiki Zings, and a Mega Chomp. After getting past the enemies, the Kongs must then time a Barrel Cannon launch to blast past four Flaming Tiki Buzzes and land on a tilting platform. This time, the Kongs must dodge a series of Giant Pillars to avoid getting hit or falling due to the platforms being destroyed by the pillars. The last tilting platform opens the mouth of a monkey head statue which leads to the Slot Machine Barrel. 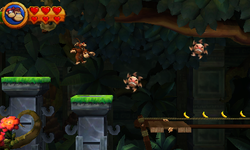 After being launched by the first two Barrel Cannons, the Kongs must long-jump to the left to find the first Puzzle Piece. Right after the three pillars with Awks and Tiki Buzzes, the Kongs should jump on the last Tiki Buzz to reach a section obscured by leaves with the Puzzle Piece. After the first checkpoint, the Kongs must bounce on the first Tiki Buzz to get on top of the tilting platform with grass. The platform must be tilted to the right side of its path to reach the Puzzle Piece. After being launched from the Barrel Cannons from the giant button, the Kongs must have the column tilted to the left and jump to the waterfall to enter a Bonus Area. Here, the Kongs must time the Barrel Cannon blasts to collect all the items and finally the Puzzle Piece. When the second Screaming Pillar collapses, the Kongs must stand on it to reach some climbable grass which leads to Bananas and the Puzzle Piece. The Kongs should collect the circling Bananas to the right of the Mega Chomp (while avoiding the Tiki Zings) to make the Puzzle Piece appear. The Kongs must tilt the last moving platform of the level past the Slot Barrel Machine to find the Puzzle Piece outside the cave. Atafuta Janguru Hurrying Jungle, from 「あたふたする」 atafuta suru, "to be in a hurry".